These days, coloured engagement rings are on the rise, and it’s easy to see why. While tradition still plays an important role in our lives, individual expression is essential for modern women. As such, many brides-to-be are now opting for distinctive gemstones over classic diamonds to suit their personalities. In particular, emeralds are currently having a moment and have been spotted on the ring fingers of ladies all over the world, including Hollywood star Halle Berry. As elegant as they are eye-catching, these gorgeous green gems make for an exciting and fashionable choice. 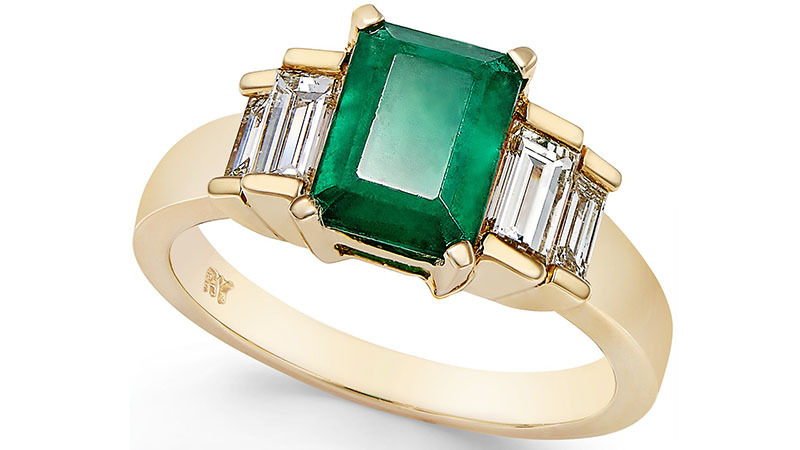 So, if you’re after an engagement ring that’s uniquely beautiful, look no further than one of these emerald options. From chic contemporary designs to terrific timeless styles, there’s a choice to suit every bride-to-be. Nobody does engagement rings quite like Tiffany. The famous jewellery label is well known for its luxurious and timelessly beautiful designs, and its Soleste Ring is no exception. This stunning platinum ring features a round emerald centre stone surrounded by round, brilliant diamonds. The carat weight for the gorgeous emerald is 0.45 while the diamonds carry a carat total weight of 0.36. Although it may set you back a pretty penny (approximately AUD$18,200), this lovely design screams eternal love. You can even have it hand engraved by Tiffany experts to add an extra special touch. Does your fairy-tale romance demand a ring to match? 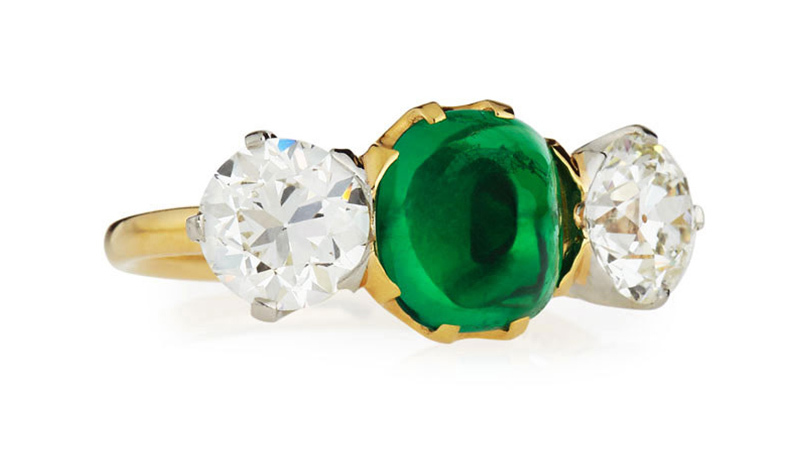 If so, you should consider Macy’s stunning 14k gold, emerald and diamond oval ring. This classically beautiful design is truly magical and will look incredible on the hand of any bride-to-be. It features sparkling round-cut diamonds, measuring 1/2 carat total weight, which enhance the opulent and luxurious oval-cut centre emerald. The emerald itself is 1-1/10 carats in weight while fine 14k gold makes up the band and setting. The full price of this charming piece is USD$3,800. For brides-to-be who love a little colour, Effy has you covered. The fabulous jewellery label offers a range of incredible gemstone bridal rings that are both beautiful and high-quality yet won’t break the budget. 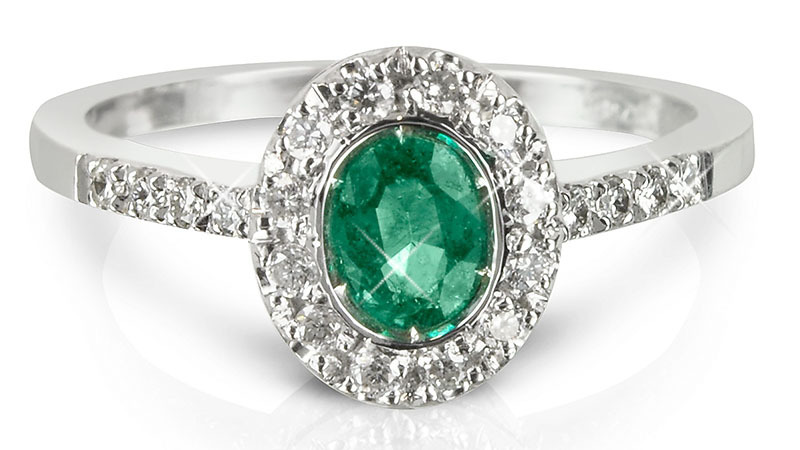 In particular, we love the brand’s emerald and diamond engagement ring in 18k white gold. The stunning design features a truly exceptional emerald-cut emerald, which measures 1-3/8 carats. Baguette shoulder diamonds and sparkling round-shape pavé diamonds along a lavish 18k white gold shank complement its eye-catching green hue. Its current price is USD$2,500. After a ring that’s as unique and beautiful as the lady who will wear it? Look no further than the Tana Chung 18k gold constellation ring. This gorgeous cocktail ring is made in the USA and it is an excellent alternative to a traditional engagement ring. As such, it is perfect for modern brides. Its eye-catching design boasts luxurious 18k yellow gold along with diamonds and a Colombian emerald at the centre. As a bonus, this stunning ring will only set you back AUD$1,684.75, meaning that you’ll have more money to spend on other things, such as your engagement party, wedding and honeymoon. An engagement ring should be glamorous, and Bloomingdale’s emerald marquise & diamond statement ring in 14k white gold is just that. This alluring and elegant piece of jewellery is perfect for modern brides-to-be. 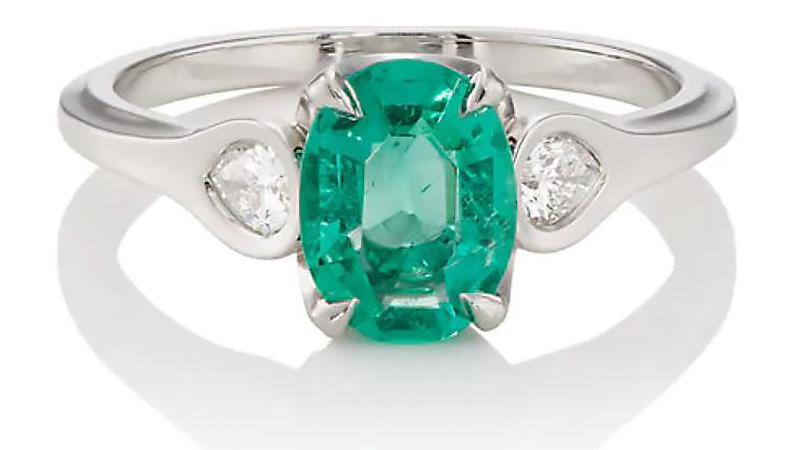 Its dramatic design features a 14k white gold band set with a marquise-cut emerald surrounded by diamonds. While the emerald itself weighs 1.0 carat, the diamonds have a total weight of 0.35 carats. As part of the 100% Bloomingdale’s collection, this stunning ring is exclusive, meaning you won’t find it elsewhere. Its full price is a reasonable AUD$6,329.84. 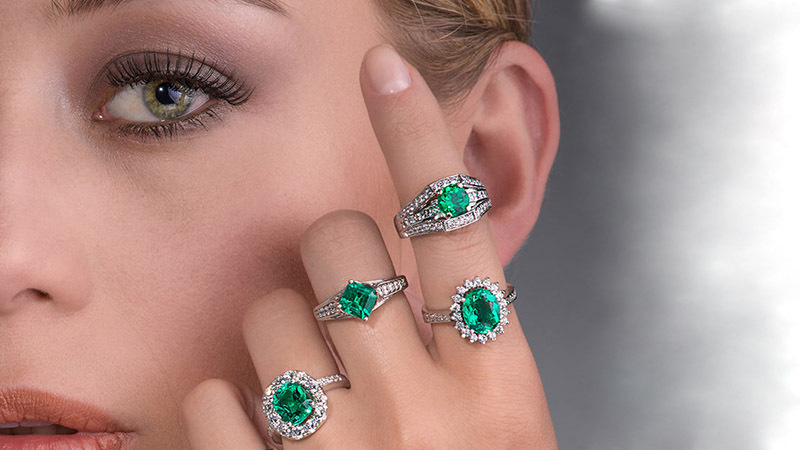 Emerald rings are available in many different settings, cuts and styles. As such, there’s an option for every bride-to-be. For those who appreciate unique style and love the charm of vintage designs, the Tiffany Sugarloaf emerald & diamond ring makes a perfect choice. The exquisite accessory, which is available from Neiman Marcus NM Estate, is from the Edwardian Period (1901-1910). Therefore, it is over an incredible 100 years old. 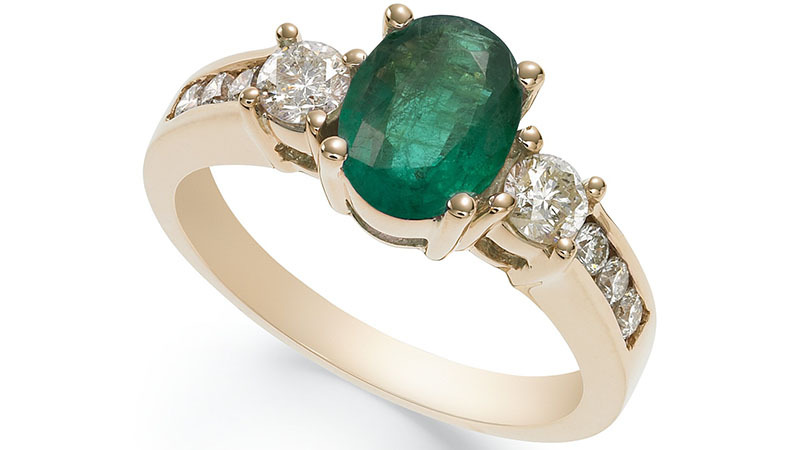 The ring’s beautiful design boasts 18k yellow gold and a stunning 2.0 carat Sugarloaf Colombian emerald cabochon. (A cabochon is a gem that has been polished but not faceted.) It also features platinum side prong settings with old European cut diamonds (1.97 total carat weight). The charming piece is currently available for a large but fitting AUD$80,000. McTeigue & McClelland has been handmaking fine jewellery since 1996. Walter McTeigue and Tim McClelland created the label, which is known for its blend of innovation and traditional techniques. The brand’s Apertresa Ring is just one example of its luxurious creations. 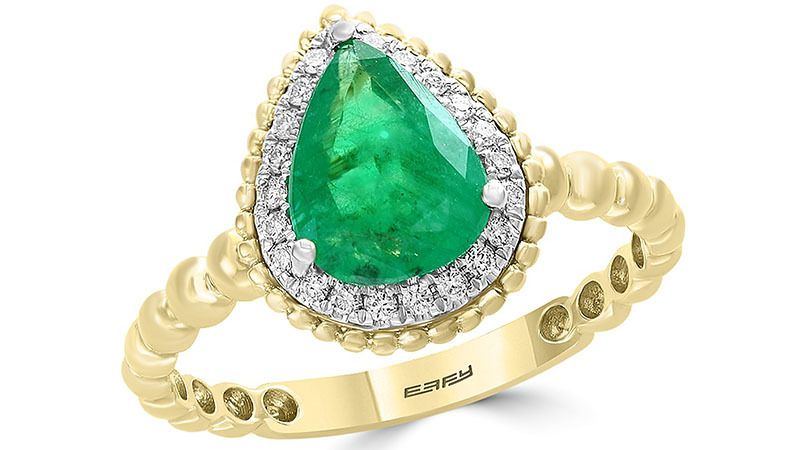 Featuring an exceptional 1.18-carat oval, brilliant-cut emerald, this ring is truly stunning. Along with its emerald, which rests on a four-prong setting, this polished platinum design also boasts two sparkling pear-shaped white diamonds. Its slender, ridged band makes it a particularly perfect option for slim fingers. Of course, expert craftsmanship, stylish design and premium materials don’t come cheap. 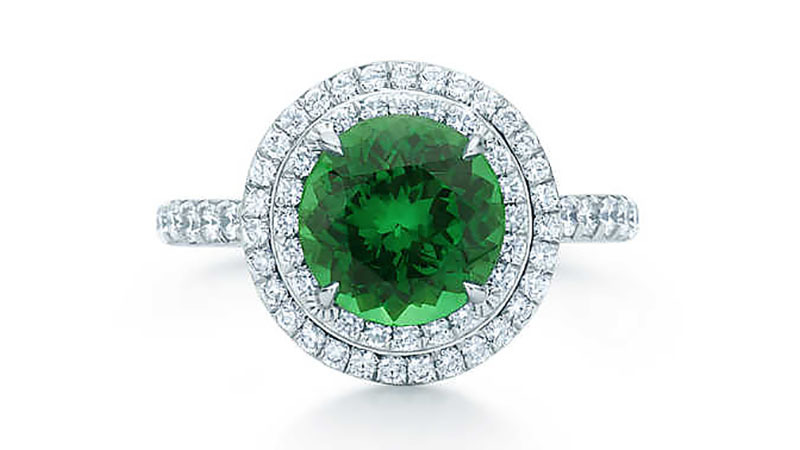 As such, this gorgeous green ring will set you back USD$10,500. Each month has a unique birthstone and emerald is May’s. As such, an emerald engagement ring can make a fantastic and personalised option for brides-to-be who were born in May. 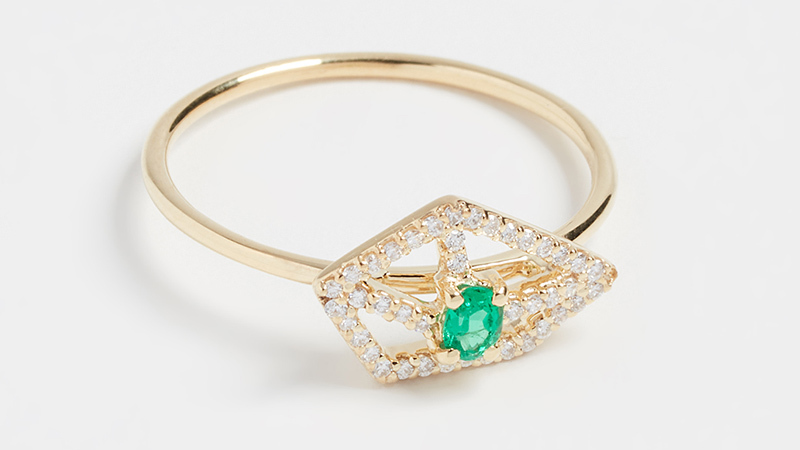 For something extraordinary, consider Macy’s Emerald and Diamond Ring in 14k Gold. This exquisite ring is crafted from 14k gold and features a beautiful design that’ll stand the test of time. 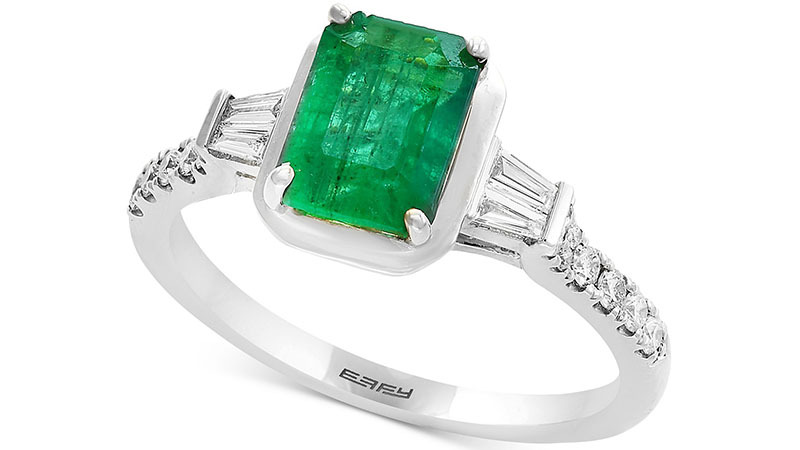 It boasts an eye-catching emerald-cut emerald, which measures 1-5/8 carats. Chic baguette-cut diamonds with a total weight of 2/3 carat offset the gorgeous green gemstone. While it’ll set you back USD$7,600, this engagement ring can also pull double duty as a romantic birthday gift. Luxury and style combine in Forzieri’s emerald and diamond 18k white gold ring to achieve a gorgeous and glamorous design. Perfect for elegant brides-to-be who love a simple yet lavish style, this ring oozes chic sophistication. The beautiful design is made from 18k white gold and features a strikingly rich emerald that rests on a halo of pavé diamonds. 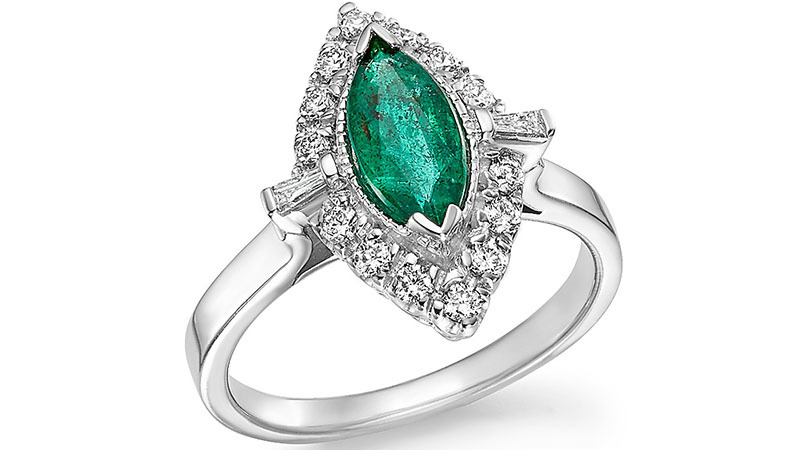 The emerald, which is oval-cut, features a basket setting. In total, the ring boasts 20 diamonds, equalling a carat weight of 0.36. Oh, and did we mention that it’s Italian made? Thankfully, all this Italian luxury needn’t break the bank. This gorgeous piece of jewellery is an affordable USD$2,478. Finding the perfect ring is part of the fun of getting engaged. To do so, you need to take personality and style into account. For brides-to-be who prefer quirky to classical, Bloomingdale’s Emerald & Diamond Beaded Teardrop Ring in 14k White & Yellow Gold can make an exceptional choice. The distinctive design boasts a beaded appearance that looks beautiful on the finger. The ring is made from 14k yellow gold and 14k white gold, making it as luxurious as it is attractive. Diamonds surround the stunning centre stone, which is a 1.20-carat emerald. Of course, when choosing an engagement ring, you need to balance personality and style with your budget. So, it’s helpful that this gorgeous accessory will only cost you AUD$3,308.78 at full price.